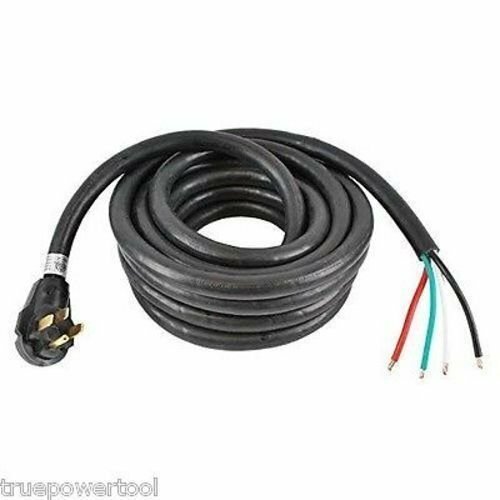 6/3+8/1 36 foot 50 amp RV Power Cord "Life Line" with Loose End Description 6/3+8/1 50 Amp, 125V-250V, 36 Foot RV Camp Power Cord, NEMA 14-50P male plug. Use with camp power pedestals, generators, or marine shore power outlets to convert from straight blade to twist-to-lock, or other applications. Always be prepared for any power receptacle configuration. Features Heavy duty solid copper wire AWG #6(3) #8(1). ETL Certified Cable is rated STW (Service Grade, Thermoplastic, and Outdoor rated) to resist wetness and sunlight 4 conductors 50A NEMA 14-50P straight blade male plug body with grounding pin 36 foot in length Wires are Double coated with a thick rubber-like insulation, offering kink-free flexibility. Cables are flexible even in cold weather.